The Christ Episcopal Church, Springfield, Missouri, is a rare architectural treasure: an 1870 Carpenter Gothic wood nave, a 1927-28 High Gothic Revival stone chancel and modern parish hall, classrooms and offices, all joined in an harmonious if unusual ensemble. Located on the northeast corner of Kimbrough and East Walnut streets, Christ Episcopal was successfully nominated to the National Register of Historic Places by St. Louis preservationist Mary Stiritz and Ozarks historian Robert Flanders. Its significance in the architectural history of Springfield and the Ozarks results from the preservation of that ensemble of 19th and 20th century Gothic Revival structures in one living building of great integrity. Christ Episcopal is also the oldest surviving church building in Springfield, and one of the few among surviving contemporaries in the Ozarks region to possess such a high degree of integrity (i.e. little changed from the original appearance). Interior: 1870 Nave (foreground), and 1928 chancel. The stone chancel arch, dividing Choir space from Altar space, is clearly visible. The higher Nave arch, intended to divide the Choir from a lofty, never-built Nave, is partially hidden behind the much lower 1870 planked ceiling of the Nave. The 1870 nave is "Carpenter Gothic,” a method of building in wood which sought an enriched, textured effect in masses and surfaces emulating the worked stone of Medieval Gothic prototypes. The 1927 architect-designed structures were indeed done in stone, and possess a sophistication of design and workmanship that place them in the first rank of Gothic Revival of the early twentieth century. 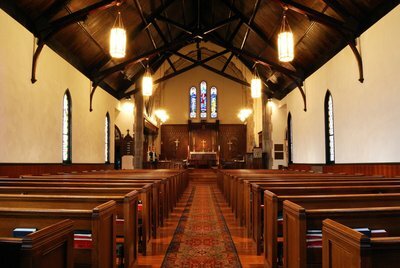 Specifically, they follow the Early English style (chancel) and English Collegiate style (parish hall). With a membership of only thirty families, the parish earnestly pressed forward with a building campaign, "taxing themselves to the very utmost.” The women of the church contributed earnings from needlework, members of the Sunday School raised money for a chancel window, and individual subscriptions were received for several other memorial windows. The Atlantic and Pacific Railroad shipped lumber free of charge from Franklin to Springfield, a savings of $272. By December, 1871, the $4,000 debt was paid off, and the new church was consecrated. A direct influence on the design of Christ Church emanated from the new young rector, Irish-born Rev. William Charles. Charles was educated in the circle of Rt. Rev. Jackson Kemper, then Bishop of Wisconsin (1854-70), a devotee of the Gothic style. Charles graduated from Racine College (1861) and from Nashotah Theological Seminary 1864), Episcopal schools founded by Kemper to prepare eastern churchmen for the frontier experience. The fervent mission environment of Wisconsin included worship in, and doubtless study of, two important Carpenter Gothic churches designed by the leading American exponent of the ecclesiastical Gothic, the architect Richard Upjohn, who was himself a devout Episcopalian. They were the Chapel of St. Mary the Virgin at Nashotah Seminary, and the Church of St. John Chrysostom, in nearby Delafield. Christ Episcopal, built in the far away Ozarks only six years after Charles left Nashotah, was thus an heir of Upjohn’s seminal Wisconsin buildings by way of the young rector. The Wisconsin churches provided Charles firsthand exemplars of the "correct,” sanctioned Medieval model in simplified and less costly form. The simplifications included building in wood, then enriching the exterior walls with a system of doubled board-and-batten siding appliqués and other cutout, built-up decorative treatments. (The board-and-batten device, an Upjohn innovation, was a unique American contribution to the Gothic Revival style). However, by the second decade of the 20th century, Christ Episcopal made plans to replace the by-then seemingly old-fashioned little wooden church with a large and elegant one of stone on the same site. Designs were submitted in 1922 by the partnership of St. Louis architects Hoener, Baum & Froese for an Early English Gothic nave-chancel and a Collegiate Gothic parish hall. P. J. Hoener was a St. Louis architect who had come to Springfield in 1919 and gained commissions for several public buildings including school, hospital and church designs. In 1922 he returned to St. Louis as president of the new partnership, taking the Christ Church job with him. Hoener and his partners were to become well-known architects of more than seventy churches. Although the 1922 project was abandoned when bids greatly exceeded budget, four years later the building campaign was resurrected, this time as a three-phase undertaking. Parish hall and chancel were completed as planned. The lofty new chancel consummated, now in high style architecture, the canonical Gothic motif first begun at Christ Church sixty-two years earlier: great stone nave and chancel arches, and staged elevation of choir and altar, demarcated progressively more sacred interior spaces. The fine, sparsely ornamented exterior stonework exemplified the relative simplicity of the Early English Gothic idiom, as did the disciplined scale and proportions of the fenestration. The third, final, nave phase of the new church was never realized due to the onset of the Depression. It was a fateful occurrence, for thereby the 1870 nave was spared. When the new chancel was completed, it was at first joined temporarily, then at last permanently, to the much lower 1870 nave. This conjoining of old and new gives Christ Episcopal a unique and extraordinary appearance, both outside and in.